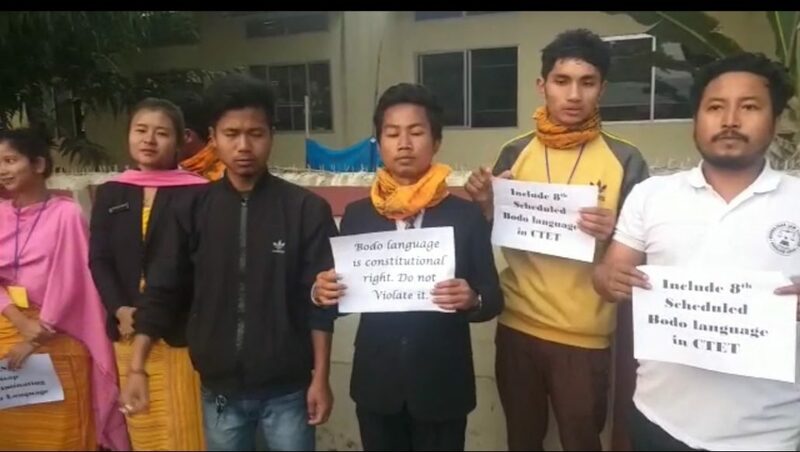 Over a hundred students and the North-East Forum for International Solidarity (NEFIS) activists protested along with the students of Bodoland University and different colleges of Kokrajhar on Thursday against the discriminatory step of Central Government to not include Bodo language among the languages offered in the CTET examination. The Bodo language is included in the eighth Schedule of Indian Constitution, which lists the recognized major languages used by the people across the country. Exclusion of Bodo language from the CTET examination which includes 20 of 22 languages of the list amounts to a blatant attempt at discriminating against one of the most deprived communities of the country, they alleged. Most of the state government-run schools have local languages as medium of instruction. However, when the examinations are conducted by the government agencies many of these languages are not allowed as an option. This is a measure which creates exclusion for majority of the applicants who have studied from government schools and belong to poor and deprived backgrounds they further alleged. The NEFIS and students demanded that all eighth scheduled and local languages that are medium of instruction in government schools across the country should be included as an option in all the all-India examinations including CTET exam further NEFIS activists said it will continue the struggle in Delhi and pressurize the government to include all the eighth Schedule languages in the examinations conducted by the government agencies.